Welcome to my rose garden dream. This collection of flower lamps was created with one goal - to reflect on beauty. In particular, how stunning, exquisite and magnetic flowers are. 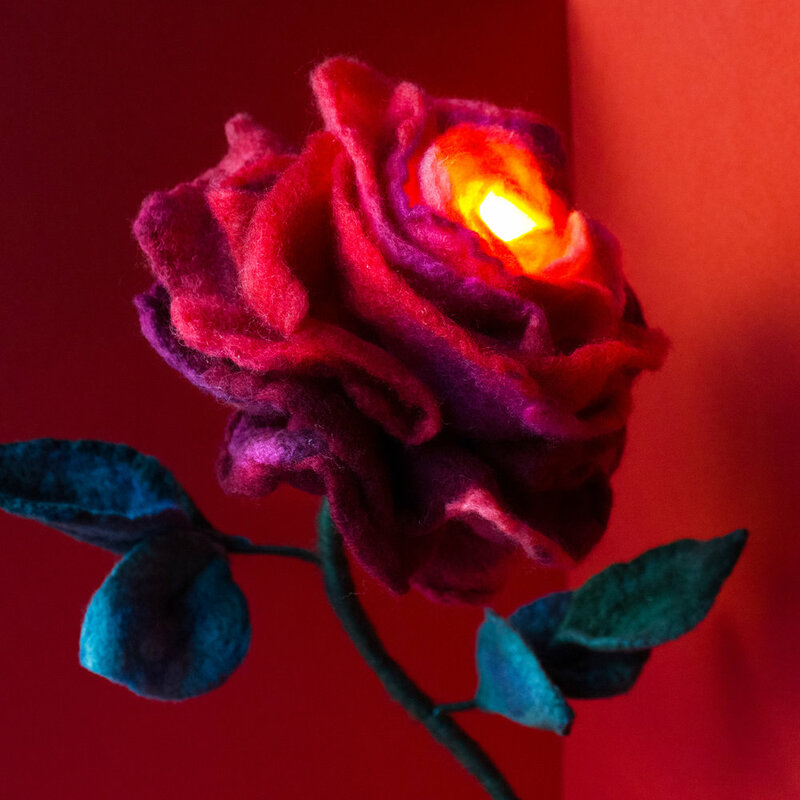 These roses are made of 100% wool, which is hand-dyed and hand-felted. The light, soft and gentle alike that of a candle, lightens the room without waking up. Perfect for bed times or mood-setting. 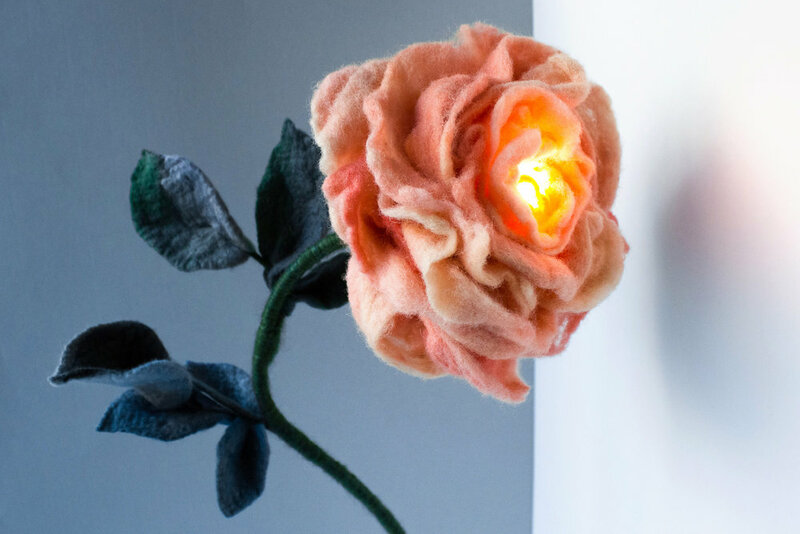 Hand-dyed with avocado pits and other natural dyes, the Peach Rose lamp will warm up any interior. Delicate, but not fragile, it features a flexible stem and adjustable leaves for personal customization purposes. ☛ Apologies, not currently available. Get notified when this and other Flower Lamps become available for purchase. The bold, fuchsia-colored petals, complemented by emerald green leaves, make this lamp an ultimate centerpiece. Strong and proud, this Cherry Rose was colored with a variety of natural dyes to achieve its Venetian Red color. The lightest flower in the collection, the Thyme Rose was hand-dyed with avocado pits and other natural dyes. It all starts with a good old watercolor sketch. To shape the wool into the leaves, I use a needle felting tool. For the petals, I color wool with natural dyes (like avocado pits). Then I wet felt them them with hot water and soap. Then, I use wet felting to turn the wool into felt strips. Time to assemble the lamp! I wrap yarn around the stem, attach the leaves to a firm wire and (the most exciting part) sculpt the flower head around the LED light bulb. Join the mailing list, and you’ll be first to see my new Flower Lamps and other felt creations. The lamps use energy-saving LED light bulbs, which produce and maintain very low heat. They might be warm to the touch, but they are nowhere near as hot as CFL, halogen or incandescent bulbs. Since the temperature is not enough to ignite fire, it’s absolutely safe to use. That said, felt is a flammable material and should stay away from candles, cigarettes and other open fire. One day I was doodling flowers at a work meeting. Suddenly, I had something like a vision: a lush peony made of felt with light emanating from its blossom. I had an old IKEA lamp which I didn’t like because of its pointy, almost-blinding LED light. I realized that wrapping felt around it would help disperse the light and turn it into a beautiful night lamp. That night, I felted and glue-gunned like I was possessed. Finally my first Peony Lamp was ready! It looked beautiful and was functional, but most importantly that Flower Lamp felt true to who I was, like nothing ever did. I’m happy to say I lit it up every day since then. Which is why now, a year later, I felt a burning desire to create this collection of Flower Lamps.